BOSTON, MA -- The month of January has come to an end as we get set of the final stretch of the regular season. The first month of 2018 included a ton of great action across the Eastern Hockey League Primier (EHLP) and numerous candidates for the latest set of TSR Hockey Stars of the Month. 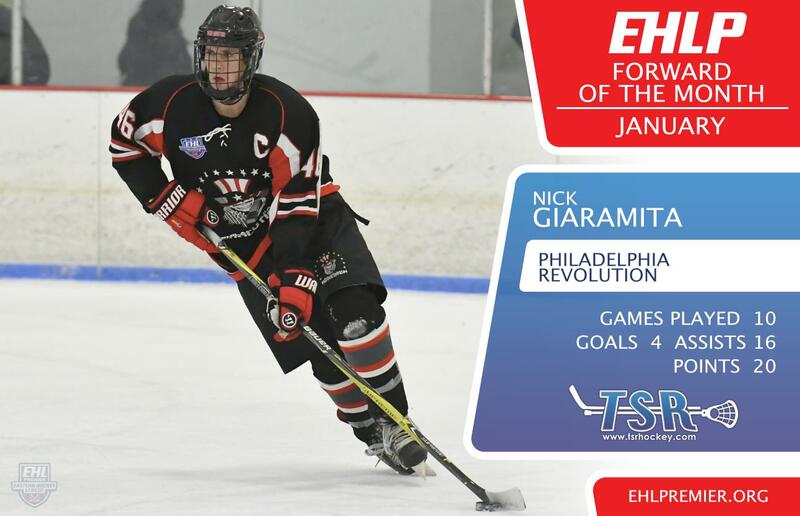 The EHLP is pleased to announce that Nick Giaramita (Philadelphia Revolution), William Veaudry (Central Penn Panthers), and Jon Szynalski (New Jersey 87s) have been named the TSR Hockey Stars of the Month for December. Giaramita was a large part of the Revolution’s 8-1-1 record in the month of January, as he notched four goals and 16 assists for a total of 20 points. The '98 is the Revolution’s leading scorer this season with 46 total points, and he maintains a 1.35 point per game average in 34 games played. The native of Florida, produced a big game at the January Showcase with a goal and three assists in his team’s win over the Philadelphia Jr. Flyers. Giaramita also recorded seven points in a win against the Central Penn Panthers at the end of the month. The Revolution will look to keep up the strong pace in the month of February, with games at home this upcoming weekend against the Philadelphia Little Flyers and the Central Penn Panthers. 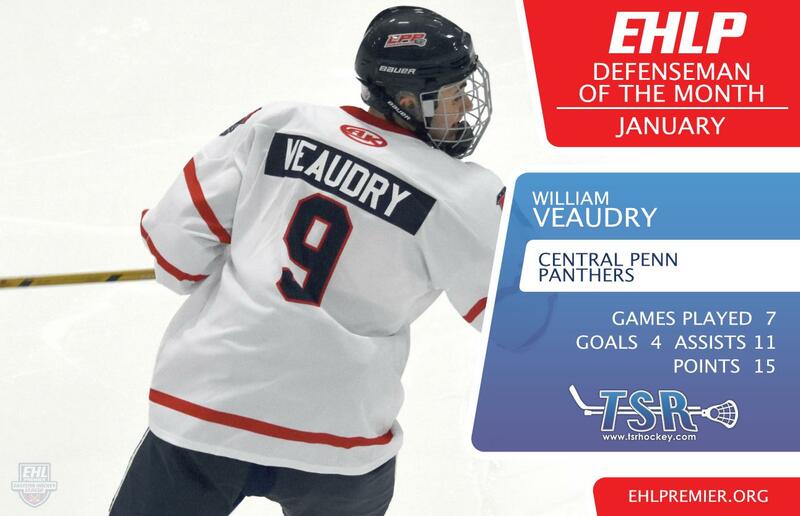 Veaudry finished the month of January with 15 points, leading the entire EHLP in defensive scoring. The '99 now has 24 points to his name, with 10 total goals and 24 assists, while being dressed for 25 games for the Panthers. The native of Canada has a 1.36 total point per game average, and leads the league in the assists category among all EHLP defensemen. Veaudry came up big with three assists in the Panthers win against the Philadelphia Little Flyers at the beginning of the month. The defensemen also played a big role from the blue line in his team’s shutout win against the New England Wolves at the January Showcase, tallying a goal and a pair of assists. This is Veaudry's second month honor of the season (November Stars of the Month). The Panthers will get right back to work this upcoming weekend with road games against the Jersey Wildcats on Saturday and the Philadelphia Revolution on Sunday. The 87s posted a perfect 7-0-0 record in the month on January, and Szynalski was between the pipes for four of those wins. With the perfect month, the '97 netminder improves his record to 12-3-0 since joining the 87s in late October. Combined with his five starts for the New Jersey Renegades, Syznalski is 14-6-0 for the season to go along with a 2.52 GAA and 2 shutouts. This is the second consecutive monthly honor for the New Jersey native, as he also was named the December Goalie of the Month in the EHLP. Since joining the 87s, Syznalski has helped New Jersey (2nd place) close to within two points of the Philadelphia Jr. Flyers for the top spot in the South Conference. They will look to continue to cut into the deficit when they host the New York Applecore on Saturday and Jersey Wildcats on Sunday.